How does LG's rebooted design compare to last year's innovation? The LG G6 is a phone that largely leaves behind the work of the LG G5 and reboots it in a way that brings a more sophisticated and refined device to the market. Gone is the modular design and removable battery - instead, we've got a water-resistant chassis and an all-in-one body that feels much more premium the second it's picked up. In terms of price, we're expecting both phones to be very similar: the LG G6 hasn't got an actual cost attached to it yet, but at worst we're expecting it to be around $50 / £50 more SIM free. The bigger question is whether it will erode over time in the same way that most LG phones do - some of them have fallen to nearly half their original cost over the lifetime on the shelves, and many will be hoping LG does the same with the G6. Right now, if you’re choosing an LG phone, you’ll be mighty tempted by the much-cheaper G5, despite the upgrades that the South Korean brand is delivering with its 2017 flagship. In terms of design the two handsets share obvious DNA, but largely the phones are more distinct than we're used to seeing for a sequel. The dual camera setup and fingerprint scanner on the rear are still there, but the protruding camera bump is gone on the newer G6. LG has mostly kept the same camera spec in terms of sensor size, but slimmed down the module to allow the sleeker look. The modular, pull-apart nature of the LG G5 is no more - while there were only few modules to buy for 2016's phones, they'll be literally useless with the new G6. LG has enabled the water-resistance by making the new G6 a glass device front and back, with a metal rim around the outside to house antennas and hold the phone together. The screen is the biggest change, however - sure, it's still LCD technology, but the new FullVision 18:9 ratio is longer and takes up far more of the front of the phone for the G6. It's rather striking in a way that the LG G5 was not - that phone felt a little loose and could wiggle in the hand a little bit, despite being a full metal body. Both phones use USB Type-C and have a single firing speaker to output sound, but in terms of design that’s where the similarities end. The user interface is also similar across the two phones, although LG has done some UI work to increase the amount of stuff on the screen throughout as the longer screen means more pixels to play with. 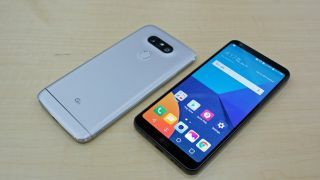 However, use both and you’ll instantly recognise them as LG phones - the main way of flipping through the handset and the lack of an app drawer being the main similarity. The battery is a big change for the LG G6 in many ways - firstly, moving up from 2800mAh to 3300mAh. However, the type of battery (from a lithium-ion to a lithium-polymer) means the same amount of energy can be squeezed into a smaller space, thus enabling the thinner phone. This comes at the cost of a removable battery, although we’re now at a point where people are so used to carrying around portable chargers if they’re worried about extending battery life that’s it’s not really an issue any more. There’s no difference in battery saving modes though - LG has said that its expertise with the Snapdragon 821 chipset means it should be able to run the phone longer than if it were using the new Snapdragon 835, so there’s every chance the LG G6 could offer significantly longer battery life than its predecessor. The LG G6 camera is similar to last year’s model, in that it packs one wide-angle and one more narrow focus. However this year the sharpness should be much more similar between the two sensors, simply because instead of the 16MP and 8MP split on the G5 sensors, both are now a 13MP option. The idea is to make the quality level the same between both snaps, whether you’re shooting in wide or more narrowly, but currently it’s not quite there. There’s a noticeable difference in color balance, and the lack of optical image stabilisation in the wide-angle lens on the G6 does make picture a little less sharp. Then again, it’s a step up on the G5 - some might wonder why LG persisted with the dual-camera setup, but the fact is having two cameras on the rear of a phone is the current fashionable thing - so LG doesn’t want to lose that advantage. The wide-angle option doesn’t seem to offer a huge benefit on either phone, but like Apple’s iPhone 7 Plus portrait mode and Huawei’s black and white sensor, LG has its niche and its sticking with it. The LG G5 and LG G6 are rather different in most ways (other than the user interface and home screen) - but we expect them to be poles apart in price. The LG G6 is by far the more refined of the two, but there’s still a charm about the LG G5 that many find hard to ignore - if only LG had kept up with the modular designs, it could have been the real cachet for that phone. Both devices feel smooth and rounded in the hand, both have high-resolution screens and both have function-rich cameras. However, the G6 is the more ‘grown-up’ of the phones, where the G5 is the far more cost-effective purchase.